I recently returned home after three days at the CSHM-CAHN joint conference, held from May 30 – June 1 at the University of Ottawa under the umbrella of the 2015 Congress of the Humanities and Social Sciences. The University of Ottawa, and the city itself, proved to be a charming host. The walk from my hotel was a quick 15 minutes including a scenic view from a pedestrian bridge over the Rideau Canal to the Faculty of Social Sciences building, where the CSHM-CAHN set up shop for the conference. I would also like to add my thanks to the local conference organizers, Marie-Claude Thifault and Isabelle Perreault who ensured that the meeting ran smoothly. As a frame for my reflections on this year’s meeting, I used a technique employed by Tom Peace who has published blog posts analzying program of the Canadian Historical Association’s annual meeting in order to get a sense of the state of the field over on ActiveHistory.ca. 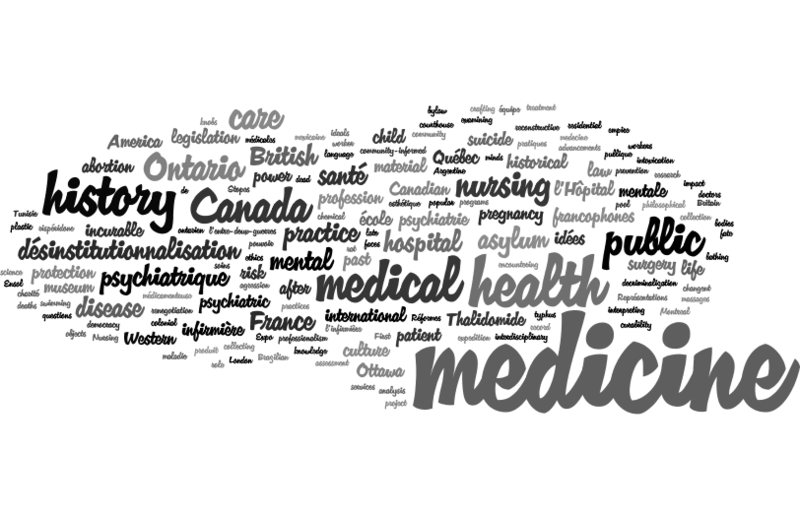 Using Wordle and Voyant, I entered key words from the session titles and individual papers from the CSHM-CAHN program in order to create word clouds that represent the most frequently used terms. I omitted dates from the keywords and I retained the original language of the keywords when I entered them. True to the nature of the conference, the most commonly used keywords captured in my word cloud were ‘medicine’ and ‘medical,’ ‘health’/’santé,’ ‘history,’ ‘Canada,’ ‘nursing,’ and ‘public.’ Some of the themes of the sessions are also represented in the keyword analysis, such as the strong interest in the history of mental health and psychiatry, reproductive health, and legislation, as well as innovative teaching methods. This word cloud captures some of the stand-out papers and sessions at this year’s meeting, including the After the Asylum session, which reflected on a seven-year collaborative interdisciplinary and multi-media team research project (see Steve Palmer’s blog post for his thoughts on the panel). Also captured in this word cloud, was Jenna Healey’s paper, “How Late is Too Late? : Negotiating the Age Limit for Pregnancy in 20th Century America.” A graduate student at Yale University, Healey was awarded the Segall Prize on the final day of the conference, which recognizes the best student paper presented at the annual meeting. Unfortunately, I missed her presentation, but I’ll be on the lookout for her full study when it’s published. A couple of other observations out of the word cloud: Geographically, projects considering Canada, Ontario, Britain, France, Quebec, and America were all strongly represented. There was also a robust selection of French-language presentations at this year’s conference when compared with the previous five years. At this year’s conference, 34 percent of the papers were presented in French, compared to 21% (2010), 12% (2011), 14% (2012), 11% (2013), and 13% (2014). This represents the bilingual spirit of the conference, the strong scholarship produced in both official languages in Canada, and the bilingual host university. Also not visualized strongly in the cloud, the work of many academics whose individual research interests made for interesting, engaging, papers presented at the meeting. Several graduate presentations stood out particularly in my mind, including Elizabeth Koester’s paper, “Private Detectives, Back Massages, and Electric Knobs: Law and the ‘Practice of Medicine’ in Early Twentieth Century Ontario,” Michele Filice’s presentation, “Rebuilding Faces, Rebuilding Lives: Advancements in Plastic Surgery and Veteran Care after the First World War, 1918-1938,” and Casey Hurrell’s contribution, ” ‘The translation of our ethic into practice’: The Prevention of War as Primary Care, 1951,-1982.” Hurrell also acted as the spirited master of ceremonies for the annual Strawberry and Champagne book launch. As the keywords I entered into Wordle didn’t include dates, I wanted to get a sense of the chronological focus of the papers presented at the conference. In order to do so, I surveyed the titles and abstracts of the papers in the program, following Peace’s method. The approach I took wasn’t particularly precise, as, while some of the papers used specific dates, others used phrases such as “turn of the century,” making this chart quite impressionistic, rather than conclusive. Nevertheless, it seems as though the majority of the scholarship presented at the meeting had a modern focus. Papers on the ancient and medieval periods were notably absent and few papers considered events prior to 1800. I did wonder if this is part of the trend identified by Peace and discussed in Robert Englebert’s blog post on ActiveHistory.ca, “Where has pre-Confederation history gone? 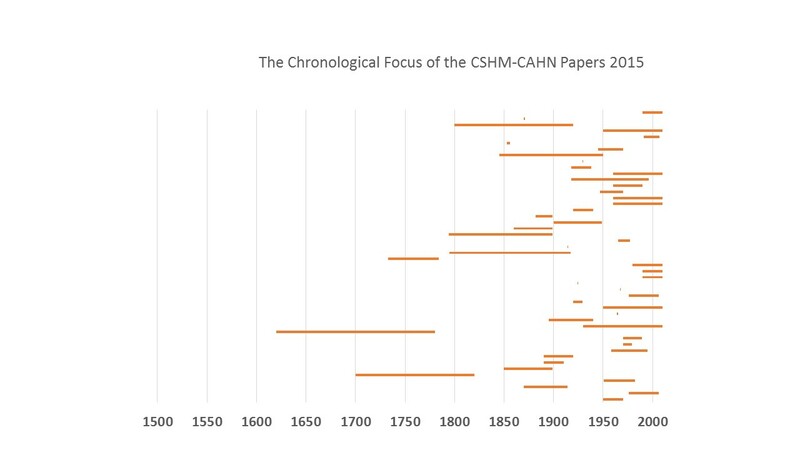 The CHA and the changing contours of a discipline.” The CSHM conference tends to display a modern focus, representing the research interests of its membership, but the trend this year may have been slightly more pronounced than in the past five years. Of course, the papers that I listened to and the conversations I had with other conference attendees can’t be captured in a word cloud, keyword analysis, or graph. I want to thank everyone for the insightful and engaging exchanges of ideas that took place, both formally and informally, over the course of the conference. As I currently do most of my research from a small town in eastern Ontario, about a two hour drive from Ottawa, the conference quite literally reminded me that I’m not alone in the wilderness, at least the scholarly one. I look forward to another engaging conference in October with historians of health at the Manitoba – (N.) Ontario – Minnesota – Saskatchewan (MOMS) History of Medicine Conference in October at the Northern Ontario School of Medicine in Thunder Bay. I would like to emphasize that I’m using Peace’s techniques in order to frame my own personal reflections about the CSHM-CAHN 2015 conference. The conference does not give a complete impression of the state of the field, but rather captures the interests of the members of the associations who presented at the conference this year. I omitted the keynote addresses from my analysis. Obviously, this is an impressionistic way of going about things and this method is not meant to be particularly precise. However, I hope it gives some sense of the program. I omitted the Hannah, Paterson, and Presidential address from the calculations, counting the titles of French-language and English-language papers in the conference programs for each year and round-tables were counted as a single paper. Percentages have been rounded up. I entered precise dates, whenever possible, from those listed in the conference paper titles and abstracts. Others referred to entire centuries, which have been captured in the above graph, and there were a number of papers omitted for which I was unable to find clear dates. Again, I should reiterate that this measure is imprecise and apologize to any panelists whose dates might be under or overestimated. I interpreted the phrase ‘turn of the century’ quite broadly, allowing for a ten year period on each side of the century divide in my chart. A quick skim through the 2014 conference program revealed six papers six papers whose titles indicated they were discussing topics prior to the year 1800, while the 2013 program revealed six, the 2012 program revealed six, and the 2011 program revealed four. Couldn’t agree more about Congress serving as a trek out of the wilderness and back into the embrace of scholarly community, Kate. The program and slate of presentations that I saw this year were top-notch, and I am so grateful to be part of such a vibrant and diverse field of scholars.